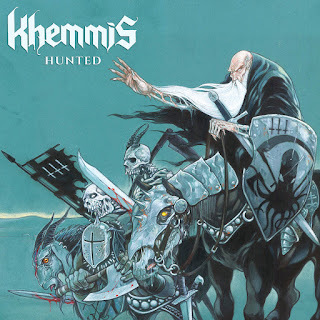 The Sludgelord: ALBUM REVIEW: Khemmis - "Hunted"
Overall, ‘Hunted’ is an extremely solid follow-up to their critically acclaimed first album. It is a melting pot of some hugely powerful styles of heavy metal music and the flawless coalescence between cataclysmic doom and melodic prog is a truly impressive feat. Khemmis are a band on a mission and so far, they’re doing it all right. 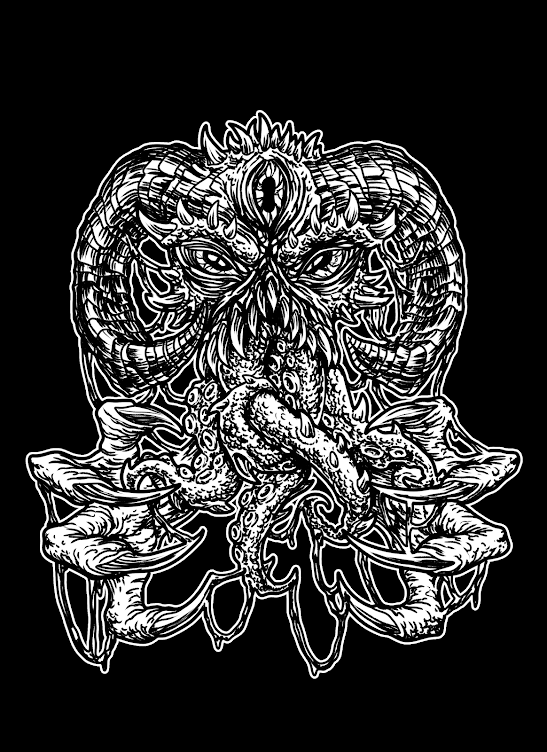 Khemmis is a 4-piece doom outfit hailing from Denver, Colorado. After the devastating impact of their first release, ‘Absolution’, back in July 2015, they are now set to release their second record entitled ‘Hunted’. They play a crushing blend of traditional doom metal with melodic harmonies in the vein of Iron Maiden or Mastodon, which gives them a very distinctive sound. ‘Hunted’ is comprised of 5 tracks, resulting in 44 minutes of power doom. It was recorded by Dave Otero at Flatline Audio and the killer cover art has returned yet again thanks to Sam Turner’s incredible fantasy illustrations. The first track ‘Above The Water’ begins with their signature harmonies over quite a prog-metal sounding intro before launching into an absolute terroriser of a riff. The general feel is very close to Mastodon with the dual guitar parts feeding off each other and spiralling the song into all kinds of melodic sections. This track has almost a Celtic feel to it and the last section sounds like it could be used as epic battle music for two warring armies. ‘Candlelight’ showcases some great vocal work from Phil Pendergast. His lyrics soar high over the top of the fusing guitar melodies ably backed up by Ben Hutcherson's monstrous guttural roar from the depths of hell around the 3-min mark. This shows the diversity in the style of the band’s music as it can change very quickly from the Maiden/Lizzy style harmonies to a monolithic doom section and the varied singing styles really provide a superb dynamic. ‘Three Gates’ kicks off with a ferocious intro section reminiscent of High on Fire/Motorhead with a rolling thunder style riff. The vocals begin harsh courtesy of Grant Netzorg (In The Company of Serpents) and then return to the clean sounding style we hear in ‘Above the Water’. The changes in this song are so dramatic that if you listen at different parts it may sound like two entirely different bands. Khemmis can deliver every element of the genre and they do it with such conviction. ‘Beyond the Door’ is the fourth track from the release and starts off with some intricate guitar harmonies and Pendergast’s truly amazing vocals creating a massive soundscape. Yet again, they launch into more thick, fuzzed out doom riffs and there are likenesses to Ukrainian doom outfit Stoned Jesus. Khemmis use contrasting styles and sections to really emphasise what makes them stand out from other doom bands today. Around the 5-min mark there is some more guitar wizardry and the solos are articulately executed. The last section of this track has a foundation-shaking riff that goes hand in hand with the slow, powerful rhythm section and the alternating vocal styles make a strong impression yet again. The final track, ‘Hunted’, is the longest track on the album clocking in at 13min 31secs. It begins with another harmony section which slowly rides out, and around 1min 20secs it takes off into another stentorian guitar riff. 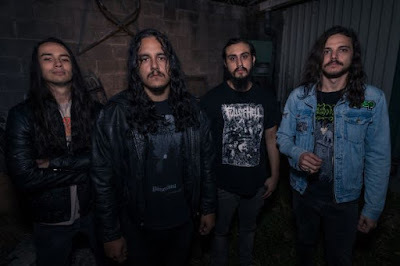 There are also hallmarks of Pallbearer present as well and you can tell that Khemmis are direct descendants of this style of doom metal and they intend to advance their craft, as they are doing ever so well. There is another blistering guitar solo section around 7min 30secs and the harmonies fuse together yet again for that trademark sound. Around 8min 40secs the track winds down into a clean guitar section that’s very reminiscent of the post-rock styles of This Will Destroy You or Explosions in the Sky. Around 11mins the track lifts off again from the mellow, clean section and builds more and more power as it ascends into the skies for the last elaborate display of melodic guitar harmonies.